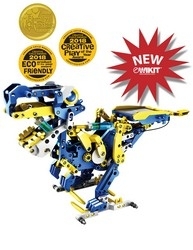 BUILD YOUR BOT – choose between the automotive or animal mode to put together a functional robot that each move in their own unique fashion. Engineered with a gear box for smooth movements, this 231 piece kit offers hours of fun. POWERED BY THE SUN – harness free energy from the sun to power any of the twelve robot builds. No need for batteries! alternative energy sources will do the job. PUMP UP THE ENERGY – Dodeca helps introduce the concept of hydraulic power technology in a playful fashion. Hydraulic power transmission helps move the created robot in a variety of ways matching their design. GEARED FOR EXCITEMENT – the vast number of gears and moving parts will help in the development of future engineers. They will learn how each piece works with others to form a finished robot with motion capabilities. RENEWABLE ENJOYMENT - The parts can be easily disassembled after completion of one robot kit. This allows for a steady source of learning and play along the way while making any of the 12 robot options. Whether building a T-Rex or a Forklift, Dodeca provides a great introduction to green technology. Dodeca 12 in 1 Solar-Hydraulic-Robot Harvests the power of the Sun with a Double XL Solar Panel and a Hydraulic Transmission.